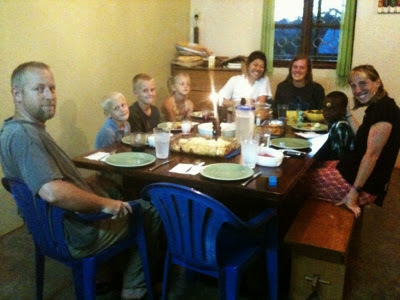 Since we have been living here in Uganda for nearly 10 months, it is unusual to think that we are still having "firsts." Life here has begun to feel like the norm. Yesterday was our first Easter here, and I was excited to combine some of our old family traditions from our years in America with some new ones here. On Good Friday I was thankful for the opportunity to share the story of Jesus' death and resurrection using "resurrection eggs." I enjoyed doing that activity with our children's Sunday School classes at our church in Georgia, and some years I was able to share the story of Jesus with our neighbors after hosting a neighborhood Easter egg hunt in our backyard. Using the resurrection eggs was familiar, but it was a different experience to be able to share the story of Jesus with the children who are living here. It is particularly chaotic to try to talk to a large group of children of various ages, several of whom have special needs, but I loved the opportunity still. I asked the older children to help retell the story because it is our goal that these children will grow up loving Jesus, equipped to leave GSF to go make disciples throughout Uganda and the world. We want them to know how to share the Good News. Our vision here at GSF is "Making disciples; impacting the world for Christ." It is my hope that learning to share the story of Jesus' death and resurrection is another piece in the puzzle, working toward our mission. On Saturday morning I had another Luganda language lesson, during which I learned to say, "He has risen, just as he said!" in Luganda. Then we drove into Jinja to buy food for a special Easter meal and for the upcoming week. While we were in town we also picked up a package at the post office that contained Reese's peanut butter eggs and Cadbury eggs along with some other Easter surprises. It was so fun to be able to give our children (and ourselves) some Easter candy. We were unable to find a ham, but found some back bacon which we decided to use as a substitute. As we were looking for ham and asking around, I realized that a much larger portion of the population than I originally thought are Muslim, and therefore, they do not eat pig meat. Since everything must be prepared from scratch, I stayed up very late Saturday night preparing for our Easter Sunday dinner. The next morning came early, and before Sunday school we had a delicious breakfast mostly prepared by the children and an Easter egg hunt. I brought some plastic eggs with us knowing that, when the time came, my kids would really like to have an egg hunt and get some candy. I was so happy to continue that little familiar tradition with my children. 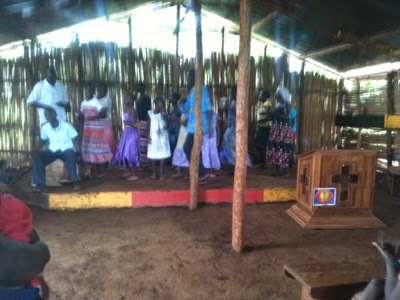 After Sunday school we went to church and I was so happy to see many visitors from the village of Buundo. We had an even more lively than usual worship service. Many around the world greet one another with the words, "He is risen." And then another replies, "He is risen, indeed." But here in Buundo village, at Light of the World church, we shouted these words in 3 languages so that the whole village could hear! Below is a photo of our Easter Sunday choir singing and dancing unto our risen Savior! After our worship service, which people around here call, "going to prayers," we had a big Easter lunch for all the GSF kids, house moms, GSF big brothers and sisters who returned to their family here for the holy day, and missionary families. There is also a short term team here on their Spring Break. It was quite a party. 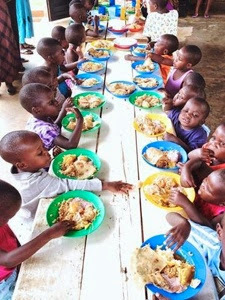 Here is a photo Caralina took of the toddlers and their plates full of food. It is amazing to see how much these little ones can eat! After the meal at the pavilion David and I did some gardening. We have been working on beautifying the campus in preparation for the upcoming 20th anniversary celebration. It has been a good outlet for us both. After gardening for a bit, it was time to head back to the house to finish our Easter dinner preparations. As I previously mentioned, we had back bacon as out ham, topped with fresh pineapple and brown sugar, along with potato cheese casserole, (finishing up the velveeta we brought back from the US) pineapple cheese casserole, green beans, and strawberry jello (sent in care packages). We had some friends join us, the two nurses who live in the other half of the duplex, Kim and Danielle, and Sarah, who is here adopting two children. Zeke fell asleep on the couch and missed the meal, but he filled up on candy earlier in the day so he was content. Here is a photo of our dinner table. Danielle and Kim even made rice crispy treats and shaped them into nests adding M&Ms as little eggs, using some of their own treats from America. It was such a nice evening! I am very thankful for a wonderful day celebrating our risen Lord!